During her lifetime Grace Coolidge contributed numerous articles, poems and knitting patterns to needlework and popular ladies magazines. 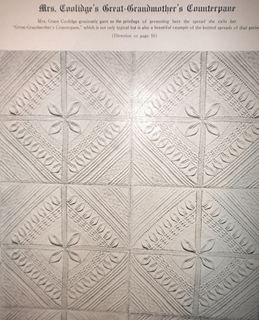 This pattern, which she edited rather than wrote, was published in the February 1930 Needlecraft Magazine of Home Arts. Entitled “Great Grandmother’s Counterpane Takes on New Glory,” this pattern is described as a dear old pattern passed down from time immemorial. It is a variation of the four-leaf clover. 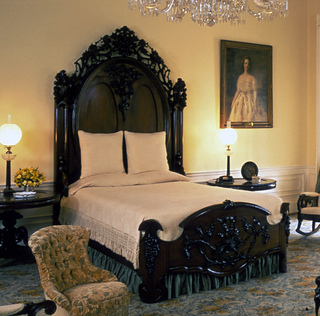 The counterpane is now in the Prince of Wales Room (Lincoln Bedroom) in the White House. Ava Coleman has updated this design use in her patterns in Stories In Stitches 1. 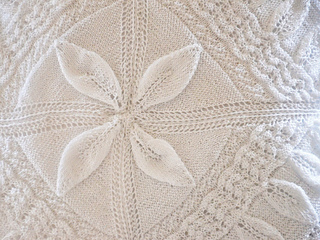 You can use the motif it up at any gauge with any yarn to create a bedspread of any size!